Almaty (Kazakh: Алматы), Kazakhstan's former capital, is the scientific, cultural, historical, financial and industrial center of Central Asia. It boasts a large tourist, student, and expatriate community, and includes a diverse citizen base of Kazakhs, Russians, Uzbeks, Germans, Poles, Chinese, among others. The city sits at the foot of Tien Shan Mountains amidst unique natural forests of wild walnuts and apples. The name "Almaty" means "rich with apple." The city came under Soviet rule in 1918. During World War II, it accommodated 26,000 persons evacuated from the European regions of the Soviet Union, hosted over 30 industrial plants from the front areas, along with numerous schools and other institutions. On December 16, 1986, a riot took place in Almaty in response to Mikhail Gorbachev's dismissal of Dinmukhamed Kunayev, the First Secretary of the Communist Party of Kazakhstan, an ethnic Kazakh, and the subsequent appointment of an outsider from the Russian Federation. The Almaty protests were not only the first signs of the failure of Soviet nationality policy, but they also preceded five years of national turmoil that resulted in the dissolution of the Soviet Union on December 25, 1991. While the city is touted for its beautiful natural surroundings and relatively modern architecture, one cannot overlook the reality of its home-nation. Kazakstan's population suffers high rates of birth defects, cancer, and other illnesses related to radiation poisoning of the soil, food products, and water sources, the result of the Soviet Union testing almost 500 nuclear weapons, above ground and often without notifying residents. Widespread protest ended nuclear testing but efforts to clean up the environment are sporadic and underfunded. The transfer of the nation's capital to Astana in 1997, and the development plan for Almaty are signs of a hopeful future for the nation. However, the consequences of its years under Soviet rule, a system which denied both freedom and the most basic of human necessities along with severe abuse of the natural environment, must be dealt with before the city and nation can truly prosper. The name "Almaty" means "rich with apple". The older Soviet-era Russian version of its name, Alma-Ata, returned to its Kazak form - Almaty - following Kazakhstan's 1991 independence from the Soviet Union. Known until 1921 as Verniy, the town was renamed Alma-Ata for the many apple trees in the region. Researchers believe the wild ancestor of the domesticated apple Malus sieversii is known where it is native as "alma"; one major city in the region where it is thought to originate is called Alma-Ata, literally "father of the apples." This tree is still found wild in the mountains of Central Asia in southern Kazakhstan, Kyrgyzstan, and Tajikistan. The city is located where the Great and Little Almaatinka rivers emerge in the south-eastern part of Kazakhstan, in the northern foothills of the Trans-Ili Alatau mountains near China, at an elevation of 2300 to 3000 feet (700 to 900 meters). The climate of Almaty is quite mild when compared with the rest of Kazakhstan. Temperatures range from 4°F to 78°F (-15.5°C to 25.75°C). Rainfall varies from 1.6 to 6.8 inches (42mm to 174mm) each month. Mountain rivers and lakes are the main source of water for the city. In the mountain gorges nearby, there are numerous waterfalls, and thermal radon and sulphuric sources are used in balneological spas. Almaty extends approximately 12.5 miles (20km) from its center, with a total area of just over 125 square miles (325 sq km). With wide, tree-lined streets laid out like French avenues, numerous parks and orchards, and a backdrop of mountains, it is considered one of the most beautiful cities of Kazakhstan. The area is subject to both earthquakes and mud slides. The city suffered from severe earthquakes in 1887 and 1911, and a devastating mudflow down the Malaya Almaatinka River in 1921. To reduce the risk, blasting in 1966 precipitated a landslide to create a 330-foot (100-meter) dam which, in 1973, contained a potentially catastrophic mud slide. 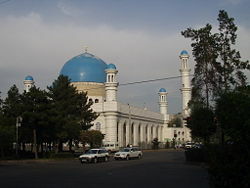 The Central Mosque of Almaty. 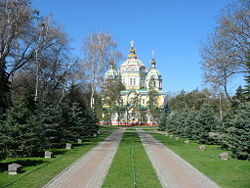 Zenkov Cathedral, a nineteenth-century Russian Orthodox cathedral located in Panfilov Park, is the second tallest wooden building in the world. 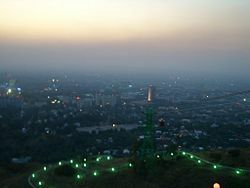 Late evening in Almaty, viewed from Kok Tube, a mountain on the city's southeastern outskirts. Bronze Age (c.3300 B.C.E. to 1200 B.C.E.) farmers and cattle-breeders established settlements on the territory of Almaty. Saka tribes and later Uisun tribes inhabited the territory north of the Tian Shan mountain range from 700 B.C.E. to the common era. From the tenth to fourteenth centuries, Almaty became one of the trade, craft and agricultural centers on the Silk Road and possessed an official coin mint. Thirteenth century books referred to the city as Almatu. In that century, Mongols destroyed the city. Descendants of Turkic tribes, Mongol groups, and Indo-Iranian tribes coalesced into the Kazakh people close to Almaty from the fifteenth to eighteenth centuries. The modern history of Almaty began on February 4, 1854, when the Russians established a fort named Zailiyskoye (renamed Verniy (Russian for "faithful" in 1855) on the site of the ancient settlement. It was a fenced pentagon with one of its five sides built along the river. From 1856, Verniy started accepting Russian peasants, and Tatar merchants and craftsmen. In 1867 the Verniy Fort was transformed into a town called Almatinsk, later re-named again as Verniy. The city became the administrative center of the new Semirechye province of Turkistan. According to the First City Plan, the city parameters were 2km on the south along Almatinka river, and 3km on the west. The new city area was divided into residential parts, and the latter into districts. Three categories of the city buildings were distinguished. Buildings of the first and second categories were two-storied or, at least, one-storied constructions with a high semi-basement. Buildings of categories I and II were erected around and in the center of the city, others on the outskirts. On May 28, 1887, at 4 o'clock in the morning, an earthquake lasting 11 to 12 minutes destroyed Verniy, mostly the brick buildings. Following that disaster, people tended to build single-storied constructions made of wood or adobe. The population grew to 27,000 by 1906, two-thirds of whom were Russians and Ukrainians. The city came under Soviet rule in 1918, and in 1921 Verniy adopted the Kazakh name Alma-Ata. In 1927, the Kazakh capital was transferred from Kyzyl-Orda to Alma-Ata. In 1930, the construction of the Turkestan-Siberia Railway to the Alma-Ata station was completed, and in that year the Alma-Ata airport was opened, making Alma-Ata the air gate to Kazakhstan. Both developments brought rapid growth, and the population rose from 46,000 in 1926 to 221,000 in 1939. In 1936, a new plan was created, aimed at re-creating Alma-Ata as the new cultural and comfortable capital of Kazakhstan. During World War II, the city accommodated 26,000 persons evacuated from the European regions of the Soviet Union, hosted over 30 industrial plants from the front areas, eight hospitals, 15 institutes, universities and technical schools, and around 20 cultural institutions. Motion picture production companies from Leningrad, Kiev and Moscow were also evacuated to Alma-Ata. On December 16, 1986, a riot took place in Almaty in response to General Secretary Mikhail Gorbachev's dismissal of Dinmukhamed Kunayev, the First Secretary of the Communist Party of Kazakhstan, an ethnic Kazakh, and the subsequent appointment of Gennady Kolbin an outsider from the Russian Federation. The Almaty protests were not only the first signs of the failure of Soviet nationality policy, but they also preceded five years of national turmoil that resulted in the dissolution of the Soviet Union on December 25, 1991. After Kazakhstan obtained its independence from the Soviet Union in 1991, the Kazakh form of the name, Almaty was adopted. In 1994 the government began to transfer the national capital from Almaty to Aqmola (named Astana since 1998). The transfer was completed in 1997. In 1998, the special status of Almaty as a scientific, cultural, historical, financial and industrial center was recognized. That year a new 2030 General Plan of Almaty was developed which aims at forming ecologically safe, secure and socially comfortable living conditions. Kazakhstan is a republic with authoritarian presidential rule, and with little power outside the executive branch. The mayor of Almaty is appointed by the president. 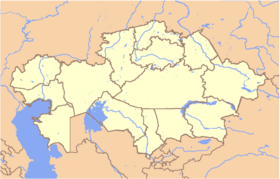 Almaty Province, which one of Kazakhstan's 14 provinces and three municipal districts, surrounds the city of Almaty. Its capital is Taldykorgan. Almaty remains the economic center of Kazakhstan. The gross national product per capita was $US4684 in 2004, which was substantially higher than the country's average of $US2699. The service sector makes up 77 percent of GDP, industry 32.9 percent, and the primary sector less than 0.1 percent. Main food and beverage products include tea, wines, candy, pasta, milk products and meat products. Manufactured items include washing machines, televisions, carpets, clothes, building materials, and metal constructions. In 2005, 1668 companies were registered in Almaty, of which 168 were big and middle-sized companies, average wages reached $US192 per month, and the rate of the unemployment was 8.9 percent. Almaty is being developed as the 'Regional Financial Centre of Almaty', launched in 2006, which was intended to diversify the Kazakh economy and decrease dependence on natural resources. The Almaty Financial Centre is managed by the Agency for RFCA development, which is a state body reporting directly to the president. The agency also operates the Kazakhstan Stock Exchange, the National Rating Agency of Kazakhstan, a Securities Market Academy, RFCA-media, and a Special Financial Court. The public transport system has nine electrified "Trolejbus" lines and two "Tramwaj" lines, whose total length amounts to 65kms. The first line was put into operation in 1937. There are 196 bus lines which carried 245.6 million passengers in 2004. Almaty Metro is a rapid transit system planned to open in 2009. The system would become the second metro in Central Asia, after the Tashkent Metro in Uzbekistan. Upon completion, the metro system will total 28 miles (45 km) in length. Almaty International Airport, the largest international airport in Kazakhstan, is located about 11 miles (18 kilometers) from the center of Almaty, and accounts for half of passenger traffic and 68 percent of cargo traffic to Kazakhstan. In 2006, the airport which is 49 percent owned by a British firm BAE Systems Ltd, and 51 percent by the Kazhak government, handled two million passengers. 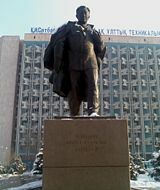 Monument in Kanysh Satpayev's honor in front of Kazakh National Technical University. Almaty's population was 1,226,300 in 2005, which represents 8 percent of the population of Kazakhstan. Representatives of 117 ethnic groups lived in Almaty in 2008. Kazakhs made up 43.6 percent of the population, Russians 40.2 percent, Uyghurs 5.7 percent, Tatars 2.1 percent, Koreans 1.8 percent, Ukrainians 1.7 percent and Germans 0.7 percent. Russian, which is the official language, is used in everyday business, and is designated the "language of interethnic communication," was used by 95 percent of the population in 1991. Kazakh was used by 64.4 percent. A total of 275 religious associations and groups representing 42 confessions of faith were active in Almaty in 2008, a 10-fold increase from 1991. Muslims made up 47 percent of the population, Russian Orthodox 44 percent, Protestant 2 percent, and others 7 percent. Universities include: Almaty Institute of Power Engineering and Telecommunications, Kazakh-British Technical University, Kazakh National Technical University, Al-Farabi Kazakh National University, Suleyman Demirel University, Kazakhstan Institute of Management, Economics, and Strategic Research, Kazakh-American University, Kazakh Academy of Sciences, Almaty State University, Turan University, Kazakhstan University of Global Relationships and Languages, and the Central Asian University. An aerial tramway line connects downtown Almaty with a popular recreation area at the top of Kök Töbe (Kazakh: Көктөбе, which means 'Green Hill'), a mountain just to the southeast of the city. The city television tower, Alma-Ata Tower, is located on the hill, as well as a variety of amusement-park type attractions and touristy restaurants. The city has 125 fountain groups or isolated fountains, including the "Oriental Calendar" Fountain, whose 12 sculpture figures represent the 12 animals of the Kazakh 12-year animal cycle (similar to its Chinese counterpart). 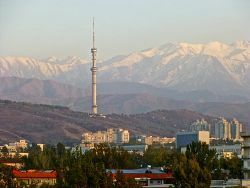 Almaty was an official candidate to host the XXII Olympic Winter Games, but was eliminated from consideration after it failed to be included in the "short list" of candidate cities. Almaty won its bid to host the 2011 Winter Asian Games. ↑ 2010 жыл басынан 1 тамызға дейінгі Қазақстан Республикасы халық санының өзгеруі туралы. Retrieved January 2, 2012. ↑ Code Of Access. Almaly.almaty.kz. Retrieved January 2, 2012. Encyclopædia Britannica Online. 2008. Almaty Retrieved June 24, 2008. Ness, Immanuel. 1999.Encyclopedia of World Cities. Armonk, NY: M. E. Sharpe Reference, ISBN 0765680173. This page was last modified on 7 March 2019, at 20:15.